Fresh lilacs and lavender in bloom, the satin and silk of a wedding dress, the softness of a flower petal or a first kiss…all of these are evoked by one of Cartier’s newest and most exquisite women’s watches. Men, if you’re looking for the perfect gift for the perfect woman, look no further than the Cartier Love 18kt White Gold Lilac Dial Ladies Watch WE801431. This timepiece in particular rises above all others, even among the luxurious Cartier collection, in its peerless grace and quality. 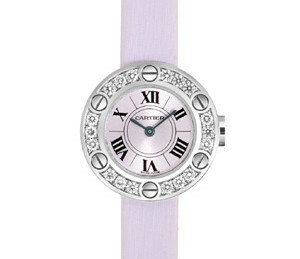 A sight to behold, the Cartier Love 18kt White Gold Lilac Dial Ladies Watch is the essence of natural feminine beauty. This timepiece has a simple design and understated style, an immaculate look where every element falls into place naturally like the unfolding of a flower. It at once captures the eyes and heart with is delicate lavender hue, both on its flinqué dial and its silky toile brossée strap. Simultaneously, one is struck by the dazzling round-cut diamonds, which sit in six sets of three and are separated by six silver screws on the white gold bezel. The muted blue steel hour and minute hands complement the watch’s subtle pastel palette, and the six black Roman numerals, elegant in their own right, also match the circular motif of the bezel, screws, diamonds, crown, and inner circle on the dial. You could definitely imagine this watch on Audrey Hepburn’s wrist in Breakfast at Tiffany’s. 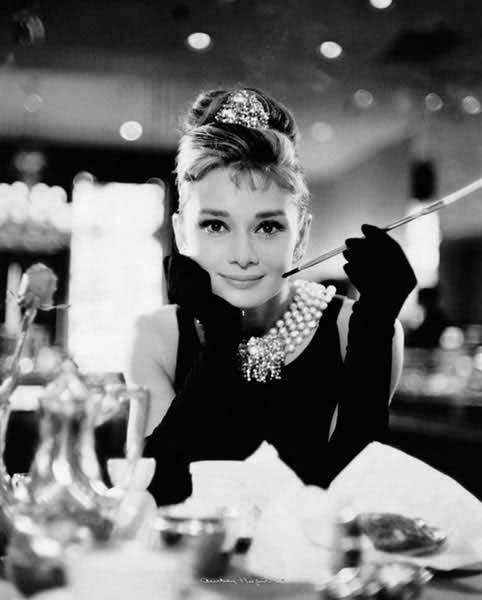 Elegant & chic: Audrey Hepburn in "Breakfast at Tiffany's"
Despite its striking beauty, there may be some who find some drawbacks. For those who want to tell time precisely and easily, the lack of these elements could be a hassle. Others may quibble with the watch’s having a quartz movement, which does not last quite as long as an automatic or manual winding movement of a mechanical watch. 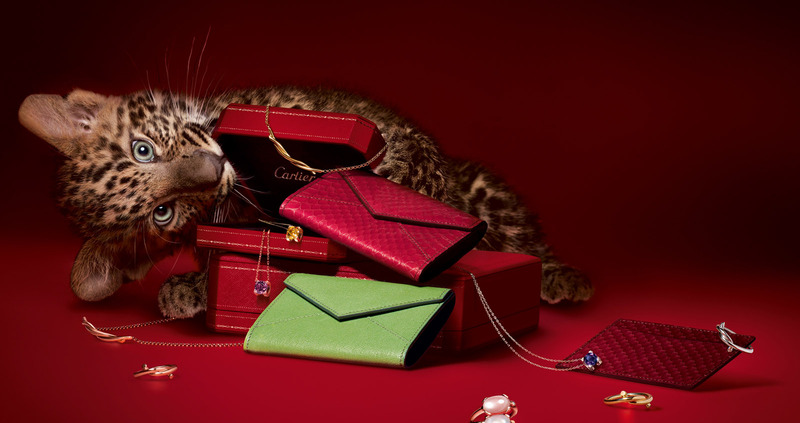 However, one probably does not buy a Cartier watch for its practicality. As for the quartz movement, that is a valid drawback, but many watches, in fact most, have quality quartz movements and last quite a long time; they are also more accurate than mechanical watches. If Cartier made this model as a mechanical watch, that would be ideal, but all in all, it’s a small flaw to an otherwise flawless timepiece. However, none of these have the exquisite coloring and feminine grace of the White Gold Lilac Dial Watch. 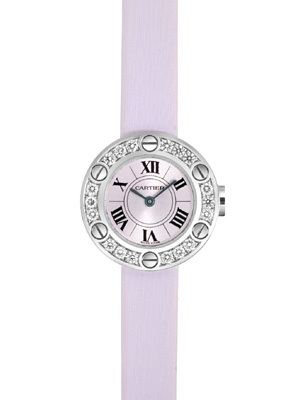 Ultimately, the Cartier Love 18kt White Gold Lilac Dial Ladies Watch WE801431 is a gorgeous timepiece that embodies flawless, timeless beauty. The Cartier watch conjures up the hope of spring, the magic of a first kiss, and the promise of a wedding vow. It is the ephemeral beauty of a delicate flower caught in time, an eternal promise to be treasured. Well worth its price, the look on a beloved’s face will be priceless when she sees this timepiece, a perfect expression of beauty and love.